but know that she will get many days of fun playing with it. The fact that it has 3 floors is also a great plus. I cannot wait until Christmas morning to see her face!!!!!! MPGH This is a beautiful toy. It is well made and just darling. My only issue with this dollhouse is that the rooms are TOO SMALL FOR THE FURNITURE! We bought this for my daughter along with several rooms of furniture. The rooms are so small that one set of furniture doesn't fit in any of the rooms! So she ends up playing with it all over the floor and can barely fit any of the HUGE bulky furniture in the tiny rooms. 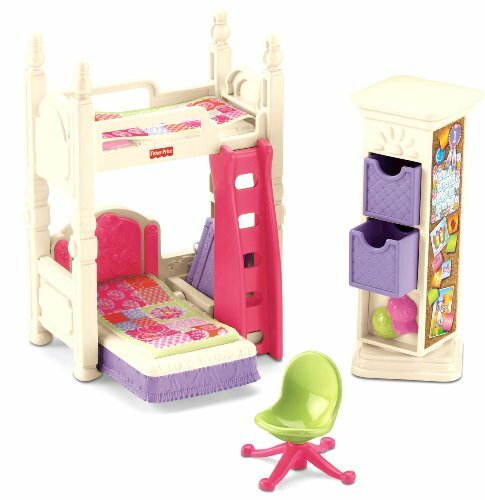 I think the regular Grand Dollhouse may have a more open floor plan allowing for more furniture to fit. But the Dream house is chopped up into too small of rooms. I would still recommend it, but buy very few furniture pieces! Mom of two We initially purchased this doll house for our 3 year old for Christmas. We also purchased some of the furniture for the rooms. The doll house only comes with a couple of pieces of furniture and family figures. ( not enough for a child to really play with the doll house) The rest of the furniture is sold separately. That really added up $$$$. We ended up finding a different doll house that was much larger, made of wood, and that came with furniture for each room for the same $$$ ( maybe even less $$$). So we returned the Fisher Price doll house and furniture. I just think that for the $$$ , the are other choices that are just as nice or nicer. Dinner Maven This is a popular toy, big enough for more than one to play with at one time. The different buttons including lights/doorbell/flushing toilet get a lot of use. The rooms are a little small to fit the furniture and dolls while playing, but taking things out and putting them back is a favorite activity in our house, so I didn't expect the play to happen exclusively inside the house. Easy and quick assembly, but I didn't let my kids know that the secret playroom can be lowered into the house. It didn't seem sturdy enough to me to be able to withstand kids jamming it down and pulling it up repeatedly. Volleyball Mom I purchased the house for my niece who is 3 yrs. what she likes about the house is all the souds it makes and the lights that light up. She really uses her imagination. The down side is that you really need to buy more accessories for the house. If you have a smart kid, they will ask, where does the baby sleep or I hear a dog, where is he? I knew she would love this house because I bought one for my daughter many many years ago and she loved it! Uncle Mike This is a cute, durable dollhouse for younger children to play with before graduating to something a little more advanced. While not particularly difficult to assemble, it can be a bit time-consuming. My niece enjoyed the fact that she could turn on the lights and flush the toilet inside the house. The initial package does not come with too many accessories, but you do have the option to purchase additional figures and furniture separately. I would recommend this product to other customers. Great Grandma Bought this for my 2 year old Great Granddaughter for Christmas for her first Dollhouse. This house was larger than expected, but she can grow with it & that is a plus. When we uncovered it for her, she was in her own little world, she loved it & so did her 6 1/2 yr old sister, which owns many of dollhouses. The only downfall this product has, it doesn't have a handle to carry it, but all in all it was worth the sale price & the smile on her face Christmas morning !